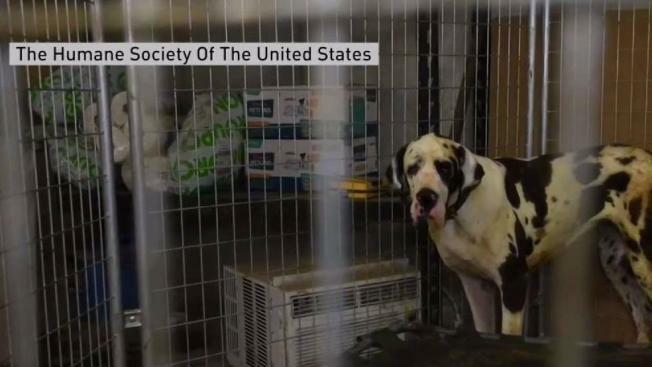 A New Hampshire woman charged with animal cruelty after 84 Great Danes were seized from her home is going on trial, but first a judge will consider her request to have a veterinarian examine the animals. The trial for Christina Fay, who has pleaded not guilty to 12 charges, is set to begin on Monday. Before it starts, a judge will hear a defense motion requesting that a veterinarian traveling from Virginia be allowed to examine the dogs on Thursday ahead of her scheduled testimony on Friday. Authorities say the dogs were living in filth and suffering from sores and other health problems when they were seized from Fay's Wolfeboro mansion in June. She has said that she took great care of her dogs.